Hooray for a National Day that is healthy and doesn’t spike your sugar, jolt you with caffeine, or have a shelf life of over 50 years 🙂 Yep…it’s National Kale Day…whoot whoot! 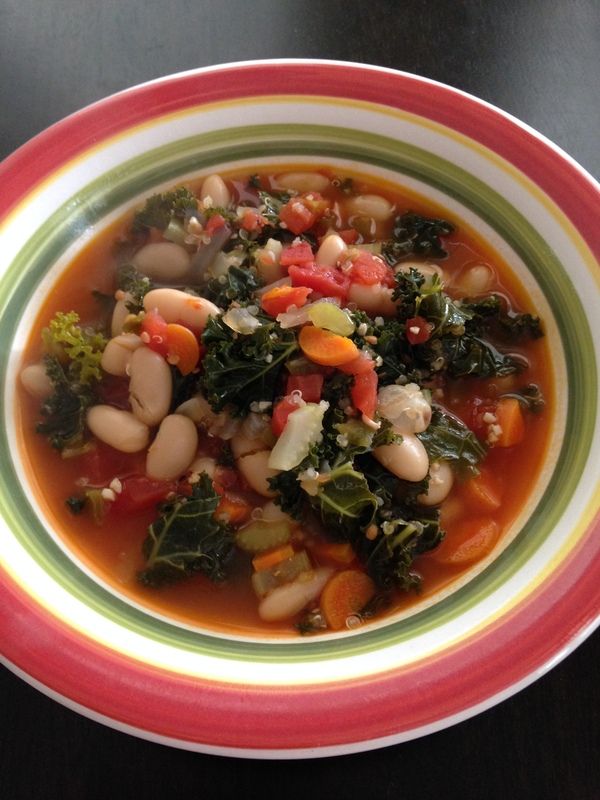 In honor of this amazing, super healthy, green that is one of the healthiest and most nutritious plant foods in existence, I am posting this very simple but oh so delicious soup recipe. For anyone interested in a little more about kale, check this out.. So, make some soup, make kale chips, make marinated kale salad, add a little kale to your smoothie, however you like it, add a little kale to your day. Saute the onion in olive oil in a soup pot for 2-3 minutes. Add carrot, celery, garlic, and pepper and sauté 2-3 more minutes. Add all of the remaining ingredients. Bring to a boil and then reduce heat to low and simmer for 20-25 minutes until the quinoa is cooked and the kale is wilted.